Tunisia, a country at the crossroads of North Africa, is not immune to the emergence and re-emergence of animal diseases, due largely to a significant increase in informal animal movements, as religious festivals approach (such as Eid el-Adha, Ramadan and Hadj), between the majority of North African countries . These movements pose a threat to Tunisia and the risk of epizootic outbreaks is closely associated with their frequency . Against this background of mobility of ruminants, which are essential production animals in Tunisia, two surveys were carried out in livestock markets before the month of Ramadan in 2016. The results of these surveys have been useful for risk-based surveillance, mainly for epizootic diseases and those with a significant economic impact. Identification and traceability are important tools for addressing animal health and food safety, and the OIE’s international standards (in particular, Chapters 4.1. and 4.2. of the Terrestrial Animal Health Code) provide the framework for its Members. Nonetheless, implementation of such systems in low- and middle-income countries remains a significant challenge. In such settings, cross-sectional studies on animal movements provide an important and achievable means of gaining an understanding of the factors that influence disease risk. The geographical location of Tunisia makes the country vulnerable to the introduction and spread of animal diseases. To better understand and assess the scale of animal mobility in order to improve the control of animal diseases, a survey was conducted in livestock markets before the month of Ramadan (2016) using direct interviews with animal owners. A total of 7,317 movements were identified during the two study periods. The north-east region recorded 31.3% of total movements. The north-west recorded 12.9%. The centre-west, centre-east and south regions had almost equal flows, with respectively 18.9%, 18.5% and 18.1% of all recorded movements. Small ruminants represented 84.6% of species traded, while cattle represented 15.4% of recorded movements. It is of primary importance to ascertain the origin of the animals found in livestock markets. In-depth knowledge of animal mobility (origin and destination of animals, numbers traded, etc.) can be used to adjust animal health strategies and surveillance plans more effectively. The trade flows identified show animal movements throughout Tunisia with a concentration of flows in the centre and north of the country. Trade with Algeria was observed largely in the north and centre of the country. 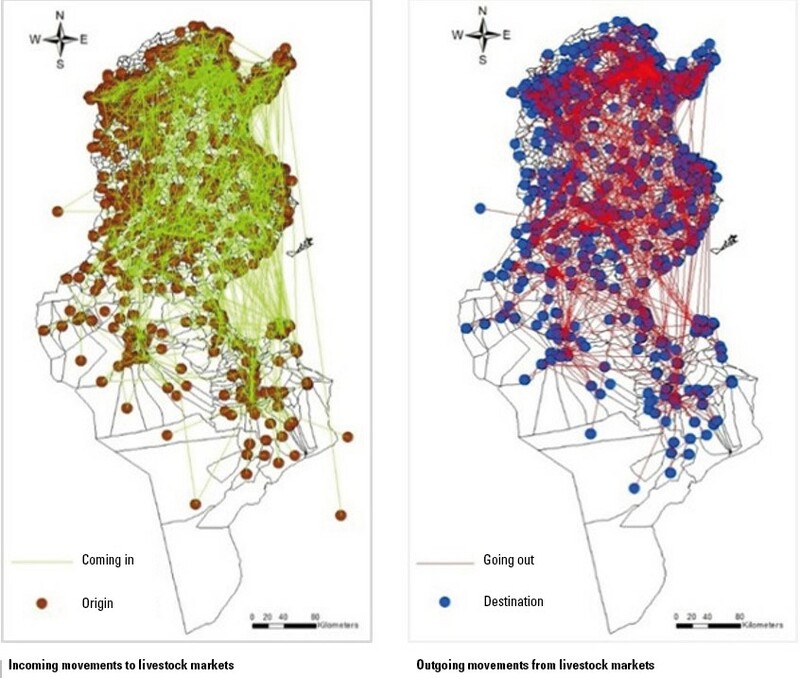 The social network analysis (SNA) method was used to characterise the livestock trade network in Tunisia and to identify the areas of high mobility. It showed that certain markets (Sidi Bouzid [Sidi Bouzid], Majel Bel Abbes [Kasserine], Gafsa [Gafsa], Mateur [Bizerte]) can play a major role in the large-scale spread of diseases (host and transmitter) and are classified as superspreaders. Other markets/locations have proven to be vulnerable to disease because they receive animals from several sources, such as the livestock markets of El Ouardia (Tunis), Beja (Beja), El Krib (Siliana) and Sers (Kef). This information is indispensable for animal disease surveillance. When setting up checkpoints to control such pathologies, these specific factors should be taken into account. The animal mobility study is an asset for the surveillance of animal and zoonotic diseases. The resulting information could be used when drawing up disease risk maps. Surveillance and management based on animal disease risk could be used to optimise the budgets allocated to animal health, especially in the Tunisian context. A regional approach to such surveys in the Maghreb region would certainly provide key elements for understanding and managing transboundary disease introduction and propagation routes. In addition, a study and regular monitoring of meat prices on markets in the Maghreb region would give a better understanding of the direction of movements, especially in the run-up to major religious festivals, and so help to optimise surveillance. These two issues are being discussed, in particular with the French Agricultural Research Centre for International Development (CIRAD), with which the National Animal Health Monitoring Centre (CNVZ) is collaborating for the first time. The second issue, regarding price movements on meat markets, will be the subject of discussions with a view to a public–private partnership in 2019. Bouguedour R. & Ripani A. (2016). – Review of the foot and mouth disease situation in North Africa and the risk of introducing the disease into Europe. Rev. Sci. Tech. Off. Int. Epiz., 35 (3), 757-768. doi:10.20506/rst.35.3.2566. Bouslikhane M. (2015). – Cross border movements of animals and animal products and their relevance to the epidemiology of animal diseases in Africa. 21st Conference of the OIE Regional Commission for Africa (Rabat, Morocco, 16–20 February 2015).